The sun has set on our May 2-4 Weekend (officially known as the Victoria Day holiday) (we were also treated to two thunderstorms) and I couldn’t have spent it with a more wonderful read than The Truth According to Us. I could not stop reading this story and it is really no wonder since it’s brought to us by the co-author of The Guernsey Literary and Potato Peel Society! That book holds an incredibly special place in my heart. It was one where I truly wanted to crawl into it and live among the people in Guernsey. In The Truth According to Us, Annie Barrows has once again swept me away with the creation of a set of wonderful characters and story. This time the setting is Macedonia, West Virginia during the waning days of the Depression. The story has been heralded as one to read for those that follow author Lee Smith. I could add to that as one to love for those that follow Harper Lee as well. Willa Romeyn in The Truth According to Us will remind you of Scout in To Kill a Mockingbird in some ways, or at least, she did for me. Willa also reminded me of Juby in The Dry Grass of August. She reminded me of these two extraordinary characters due to their keen sense of awareness and their pursuit for the truth and understanding when stepping through the mine-field that is the adult world. All three of these young girls came of age during those days with the hot and sweltering southern summer heat. For Willa, “ferocity and devotion” becomes her mantra that summer. She is determined to understand the adult world, especially the two adults that matter the most to her – her father Felix and her Aunt Jottie. She is determined to uncover where her father disappears to and what he truly does for work and also why Jottie has remained alone caring for her brother’s children all these years. What she uncovers however will not necessarily bring about happiness for all and will irrevocably change everyone’s lives. That summer, the Romeyn’s also welcome a new boarder to their home. Layla Beck has been cast out from her Washington, DC home for refusing to marry a wishy-washy man her father, a senator, has chosen for her. She keeps up with her steadfast refusal so Daddy cuts her off forcing her to get a job with the Federal Writer’s Project, a make-work project her Uncle Ben oversees. She is sent to Macedonia to cover the town’s history in time to celebrate its sesquicentennial. In the process of documenting Macedonia’s colourful history, Layla also uncovers the story and history of the Romeyn’s and reveals why this once prominent family has fallen so far from the town’s grace. Told mostly in alternating perspectives from Willa and Layla, (it sometimes is told by Jottie too), The Truth According to Us is one truly delightful read. While we are treated to the Romeyn family for the most part, Layla also brings in the stories of the other fantastically described characters that populate Macedonia. We are taken through this exquisitely charming story containing many secrets, betrayal and fierce family bonds. 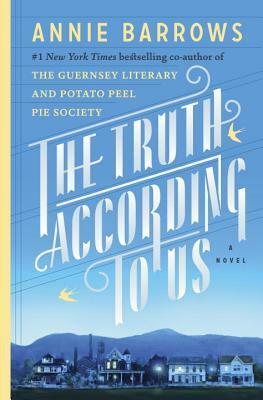 Complete with some epistolary exchanges between Layla and her Uncle Ben, friends and her brother, that make for some excellent and humorous reading, and along with the depth of the characters and the story itself, The Truth According to Us makes for fantastic summer reading. Please be sure to add this one to take along with you for your vacation reading. The Truth According to Us is particularly one to add if you enjoy reading “seasonally”, as this one will certainly sweep you away with its descriptions of the oppressive humidity and sweltering heat that plagued the habitants of Macedonia. Our Victoria Day weekend was a decent match at times for the humidity the folk in Macedonia suffered and therefore only further immersed me in the town of Macedonia, its people and history. With its charmingly drawn characters and the delicious story that is filled with secrets and drama, it made for perfect weekend reading. Reading The Truth According to Us was all-consuming for me. I thoroughly enjoyed. I miss Macedonia and the Romeyn family! 4.5 stars. Thank you to Netgalley and Random House for allowing us this distinct pleasure! SOunds like a great way to spend May 2-4. I miss May 2-4. Over here it is simply the May Bank Holiday Weekend. Doesn’t have the same ring to it. Thanks, Penny. This one sounds like a sure thing for me. I also loved The Guernsey Literary and Potato Peel Society, so I think I should add this one to my list. You make it sound delightful! It’s different from Guernsey – but there are some tinges of it in there for sure, with some written correspondence (a little bit) and the characters are really great too. It’s a great summer read for sure! I’m so glad to hear it’s amazing. I have it on my TBR pile and I can’t wait to dip in. GREAT post. Hoping you love it Lindsey!! Great story, great characters!